CNET en Espanol got an exclusive interview with OnePlus Co-founder Carl Pei. While he didn’t disclose any details about the design of the OnePlus 3, Mr Pei did disclose an estimated launch date; the end of the second quarter of 2016. A leak in early May suggested the OnePlus 3 base model to sell for $310, while a premium version, with more memory, was said to come in at $384, which fits with OnePlus’ low pricing for high-end specs appeal. On May 23, OnePlus announced via its forum that its is offering up 30,000 new Loop VR heasets for free (except for shipping). All you have to do is mosey over to the OnePlus store, ensure you select your country at the bottom right of the page, and head to the checkout. There’s still no word on when exactly customers will be able to place their preorders, but the headsets won’t be shipping until June 6. A clear render of what could be the OnePlus 3 was leaked by reliable serial leakster Evan Blass in a tweet today. The image shows the front and the back of the device with the caption ‘Never Settle’ on the front and the official logo on the back. From the render, we can see that the back will be curved and it looks quite ergonomic. It has a brushed silver finish and it would be great if this means it’s not as slippery as other OnePlus devices, like the OnePlus X. The camera protrudes from the back a bit too much. You will also notice the LED flash underneath the camera. The screen appears bezel-less and takes up most of the front of the device. The display looks crisp but we’ll have to see it in person before we can really pass judgement. We hope to see a QHD AMOLED display, which would be a significant improvement on the OnePlus 2 HD screen. Recent photos from the Chinese social media site Weibo might have revealed the final design of the OnePlus 3, and it looks like the lovechild of the OnePlus 2 and HTC One M9. From the front, the handset seems to be a slightly less square version of the OnePlus 2, (the corners are a little softer) however the rear bears a striking resemblance to the One M9 design. We don’t know how credible the photos are, but if they’re fake, they’re very impressive fakes. See for yourself below. Earlier, in December, a concept video leaked showing the possible design of the OnePlus 3. It gives us a glimpse of slick, curvy device with extremely thin bezels. The video further hints that the OnePlus 3 might go with a brushed metal back, and we can also see a dual-tone LED flash and USB Type-C charging. A screenshot has surfaced that gives us our first solid look at specs for the OnePlus 3. The AnTuTu Benchmark screenshot shows some heft but not unsurprising hardware choices from manufacturer OnePlus. The OnePlus 3 (model number A3000) could pack a 1080p HD display, 4 GB of RAM and 32 GB of internal memory. Unsurprisingly, this should all be powered by a Snapdragon 820 chipset coupled with an Adreno 530 GPU. Evan Blass, a reliable leakster, supplied a tasty specs array on May 24, confirming a 5.5-inch 1080p screen, the Snapdragon 820, along with 64 GB of internal memory and a 16 MP rear camera. He also claimed that the device will feature NFC, which the OnePlus 2 did not feature. Welcome back, old friend. 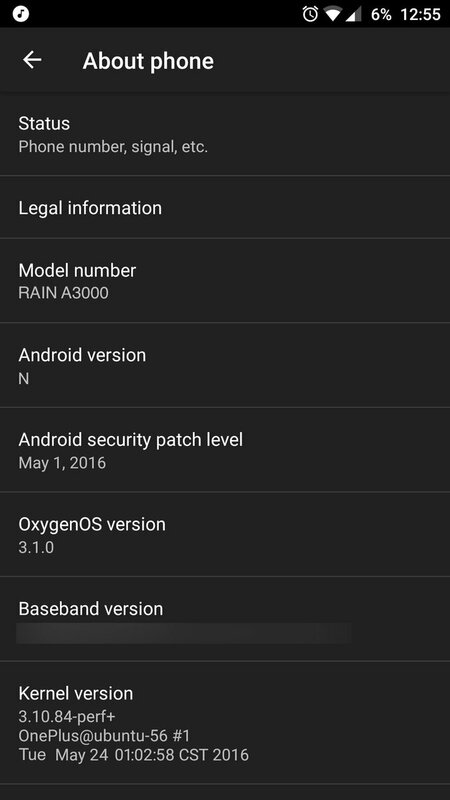 Curiously, the screen shot Evan Blass provided shows the device running OxygenOS 3.1.0 with Android N. Curious. We’d also expect the new phone to employ a USB type C port, as its predecessor did.